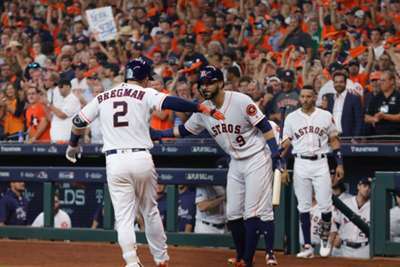 The Houston Astros took down the Cleveland Indians 7-2 in game one of their MLB American League Division Series contest. Reigning World Series champions Houston are a long way from going back-to-back but Friday was a good start as the Astros drew first blood. Astros ace Justin Verlander led the way with 5.3 solid innings and four home runs from their line-up. Verlander came out in the sixth with two runners on, but trade-deadline acquisition Ryan Pressly managed to get out of the jam and toss another scoreless inning to help the Astros to victory. Corey Kluber was the most unhittable man in the majors during the Indians' run to the World Series in 2016. The two-time Cy Young award winner went 4-1 with a 1.83 ERA in six starts before getting knocked around a bit on short rest against the Chicago Cubs in game seven. Since then though, Kluber has been remarkably average, if not bad in the postseason. In 2017, he went 0-1 with a 12.79 ERA while allowing 10 hits in 6.3 innings of two starts against the New York Yankees, and against the Astros on Friday he went just 4.6 innings while giving up six hits, four runs and three home runs. Going back to game seven of the World Series in 2016, Kluber has 10.20 ERA in his last four postseason starts. It does not make a lot of sense because he has been great in each of the last three regular seasons. But he did not have it in last year's ALDS and even in game one this time around he was struggling with his command — his fastball velocity was a bit down and he could not work the inside part of the plate. When the Astros acquired Verlander from the Detroit Tigers in 2017, Indians fans were not all that intimidated. "They had his number," they said, or, "We can beat him." They were not wrong. Over the last five years, Verlander had never posted an ERA better than 4.00 in a season against the Indians. Even when he did post one below that in 2013, it was not amazing as it stood at 3.38. But on Friday, the Indians learned Verlander can handle them in the postseason no matter his history. The 35-year-old tossed five hitless innings before exiting in the sixth after allowing two hits and two runs while striking out seven over 5.3. Cleveland was fine with Houston acquiring Verlander last season, they may not be so happy about it now. The Indians are one of the best teams at missing bats as they became the first team in history to have four starters post seasons of 200 strikeouts or more. However, with great power comes great propensity for allowing home runs. While Cleveland were the best in baseball last year allowing home runs, they took a big step back in 2018, posting the eighth-most home runs allowed by their pitching staff with 200, which is a two-fold situation for the Indians. For one, their starters throw so hard in a day in age where everyone is trying to hit home runs, they are prone to allowing more long balls, and two, their bullpen was so much worse this season than last year that they were prone to giving up bombs too. The Astros hit four home runs on Friday, three off starter Kluber and another off of reliever Cody Allen, who has historically been great against Houston. The home runs were the difference in the game as well as they accounted for four of Houston's runs and gave the Astros a lead they would never get back. If the Indians want to win this series they will have to hold down an Astros team who finished 10th in MLB with 205 home runs this season.